Your pony character has several abilities that come as part of being one of the ponykind. Age. Ponies mature at the same rate as humans, and reach old age at about the same time. Alignment. Ponies tend towards the lawful alignments. Size. Your size is Medium. Ponies are around four feet tall and long. Their weight can vary wildly, with fat and skinny ponies of all builds. human of the same strength without being encumbered. Any roll to avoid becoming prone is made with advantage. language of fey creatures, and their sing song can find its way into other languages. the purpose of what they wield. Eclectic. Each pony selects one physical and one spiritual Sub-Race, detailed below. Fey Born. 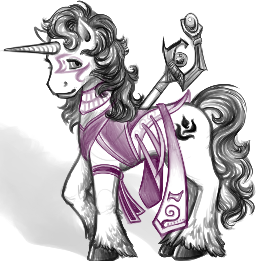 Ponies count as fey for all purposes. Hand and ring covering magic items automatically adjust to fit, becoming anklets that otherwise function normally. Any worn magical foot items (boots, shoes, etc.) adapt to cover all four extremities. Those with hooves may use horseshoe items, but doing so occupies the hooves, preventing boots, shoes, and other such things. Creatures with fingerless may wield/use items with their mouth as if their primary hand. Abilities requiring touch can be made with paws, talons, hooves or horn. There is no mechanical benefit to this and it resolves exactly the same as a humanoid touch with a finger. Unarmed attacks from ponies can come in the form of teeth, slams, or hooves. They do normal damage for an unarmed adventurer of medium size and are resolved entirely as unarmed attacks. Somatic components are handled with hoof, talon, paw, and/or horn. One-handed weapons with the ammunition property may be loaded despite lacking a free hand.